Power Consumption: positioner 1.5 W max. solenoids 5 VA max. per solenoid. Selected External Inputs: 4-20mA - impedance 250 ohm. Potentiometer - minimum resistance 10K ohm. Casing: Precision diecast LM24 alloy, anodized & epoxy stove enamel. Coupling: Zinc plated steel or stainless steel option. PositionerPerformance: Linearity - better than 1% of range deadband - 0.1 to 3% of range (subject to optimization of speed, deadband and damping). Optional 2-wire Angle Transducer: Supply voltage - 8.5 to 27v Dc output - 4-20mA, linearly proportionate to angular position, electrically isolated from all other inputs and outputs functions with or without positioner circuit energization. 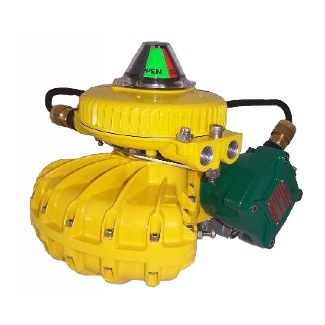 The explosion proof P3 on/off positioner offers a robust three position rotary control device with a fast, smooth, accurate response in a compact corrosion resistant, aluminium housing. The unit is available ATEX approved to Category 2 and offers four voltages, many switch options and angle position feedback. Available for close mounting on Kinetrol actuator models 05 to 15 or discrete mounting via a Kinetrol 05 square or NAMUR drive.